Shooting this German wedding at Dornier Wine Estate was both a surprise as well as a pleasure, I have always known Guido in his windsurfing gear, photographing him on Sunset Beach, the 3rd best windsurfing spot in the world so just imagine the splendid surprise and change of scenery when I first saw Guido in his formal black suit as he tied the knot to his darling Carola. The wedding was a intimate affair, with all guests being able to feast on the amphitheater of mountains surrounding the newly renovated Dornier Homestead in Stellenbosch. The wedding ceremony took place in the newly renovated Dornier Homestead in the front, showing off the wonderful facade, whilst the reception took place out in the back garden, where guests where treated to an endless array of mountains, private gardens and pool ponds, and thee most magnificent and secluded table settings where their 5 course dinner was served. All this amidst thee most spectacular array of Protea bouquets spread about all over the dinner table. Best of all was the rather novel touch to this love story – both Guido and Carola have a fondness for the scene in the famous ‘Forrest Gump’ movie when Forest releases a feather into the heavens above. Carola surprised Guido by asking all guests over the span of 1year to collect feathers so that they could be released on their wedding day. The couple then went up onto their private balcony, where the surprise was revealed to Guido and then together they both released the bag of feathers out towards all their loving guests. As you can see the children might remember it long after the wedding couple themselves. Take note of Carola’s dress, which was also inspired by these free-flowing feathery forms. 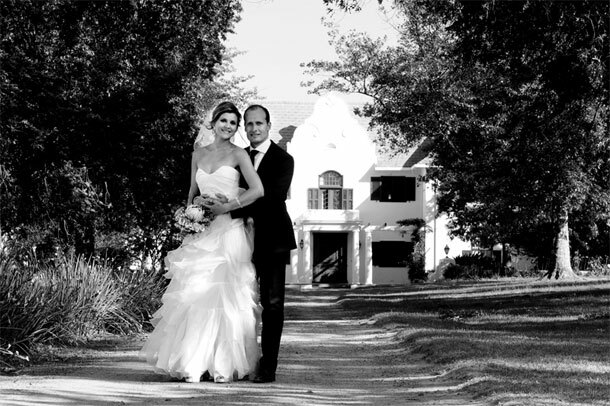 To book Charnell for you special day telephone her on +27 (0)84 366-0046. Alternatively for further details or to send an enquiry visit Charnell Timms Photography.